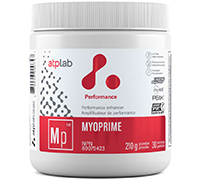 Myoprime is an advanced creatine formulation designed to enhance the body’s ability to generate more ATP due to the synergy of carefully selected ingredients. Through superior absorption, bioavailability, and utilization, Myoprime will improve max strength and power, exercise performance, recovery time & cognitive function. Creates a higher level of absorption and utilization than creatine monohydrate. Greater bioavailability of creatine and magnesium! Ergogenic activity is enhanced when magnesium creatine chelate is consumed. Greater increase in intracellular water, an indicator of greater protein synthesis. Clinical studies showed it most strongly regenerated energy needed for anaerobic performance. Enhances the body’s ability to generate and regenerate ATP for SLAMMING muscle performance! Higher level of absorption than other combination regimens of magnesium and creatine. Magnesium is an electrolyte and well known as a muscle nutrient! Facilitates VITAL oxygen delivery to working muscle tissue. Creatine MagnaPower® can be consumed with juice, water or other beverage of choice. Muscular excitability® refers to the ability to activate muscles, thereby causing them to contract. The greater the excitability of the muscle, the greater its force, velocity, and endurance properties will be. An athlete will lift more weight and produce a greater number of repetitions per set with oral supplementation of PEAK ATP® versus placebo. PEAK ATP® causes significant increases in vertical jump power versus placebo. PEAK ATP® improves muscular endurance, providing more benefits as more repetitions and sets are performed. Vasodilation and blood flow were higher following ATP supplementation, which would drive recovery processes. PEAK ATP® supplementation increases the amount of ATP in red blood cells. When muscles are fatigued, red blood cells release ATP into the blood. The ATP binds to blood vessels and causes them to dilate. The end result is increased blood flow, oxygen delivery, and clearance of metabolic waste products such as lactate. PEAK ATP® is acceptable for use in sports and is not banned by any athletic body (per review of the 2013 Banned Substance List of WADA, NFL, MLB, NHL, NBA, NCAA, and NWBF). M. Calcium-induced calcium release in skeletal muscle. Physiol Rev. 2009, 89(4):1153-1176. Recommended use: Workout supplement. Athletic support. Helps increase physical performance during intensive exercise. Increases (body/muscle/lean) (mass/size) when used in conjunction with a resistance training regimen. Improves (strength/power/performance) in repetitive bouts of brief, highly-intense physical activity (e.g. sprints, jumping, resistance training) (by increasing muscle/intramuscular creatine/phosphocreatine/energy levels). Recommended dose: Adult Males: 1 scoop 1 time per day. Mix product well in 1-2 cups of liquid (water, ce, etc.) immediately before consumption. Use for a minimum of 4 weeks.